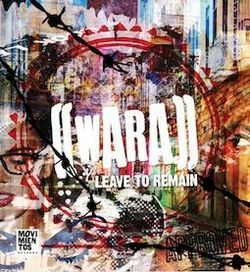 Wara, the young revolutionaries of the UK's Latin music scene, will be releasing their debut album, the genre-defying 'Leave To Remain', on 3 June on Movimientos Records, as well as taking the hot London-Havana soundclash on the road during a UK spring tour, presented by La Linea, in association with Movimientos and Global Local, supported by the Arts Council of England. 'Leave to Remain' follows their cutting edge, critically acclaimed EP 'Flesh and Bone' (Movimientos Records, 2011). The album sees the band take their trademark sound to higher grounds, effortlessly combining Cuba's most danceable rhythms and styles – Timba, Salsa, Cha-Cha-Cha, Rumba - with contemporary urban elements such as Reggae, Soul, Hip-Hop and Jazz. The songs are threaded with boundlessly multilingual and conscious lyrics that range from social and political commentary; with themes of migration, land grabs, identity and displacement in songs like "Somewhereland" and "Leave to Remain"; veering to the fickle whining party scene divas in "Caprichoso". Then there's "Run For Cover", with its London Riot fuelled theatrics, followed by an acoustic remake of "Flesh and Bone" that goes straight to the soul. The London-based nine-piece band are a hot melting pot of identities with backgrounds that span the world map: Cuba, Argentina, Venezuela, Chile, Ghana, Congo, Spain and the UK. Wara formed in 2009 and soon found that they were doing what no one else was: namely portraying what Latin Americans face when moving to UK, using the music to bend stereotypes, genres and combine stories. "We reinterpret what has already been done [in Cuban music] so it applies to young people living here in the UK in 2013," says Latin powerhouse Eliane Correa, MD and keyboard player. The rest of the line-up includes Congolese-Argentinean lead vocalist Juanita Euka (niece of legendary Congolese musician Franco), London's Josh Solnick aka MC Murmur (from London's Afro Dub hip-hop crew FUR) as multiple-personality lyricist. Add to this Afro-Cuban songstress Nana Aldrin Quaye on backing vocals, London's own George Cole on bass and Taurean Antoine-Chagar getting soulful on the saxophone. The rhythm section is held down by Venezuelan Ernesto Marichales tight on percussion, and Chilean Leandro 'Lele' Mancini on drums. Greg Sanders-Gallego plays guitar, his West African inspired riffs adding another geographical twist to the Wara sound. The album also features some very special guest contributions including vocals from two of Cuba's up and coming singers Yanaysa Prieto and Grechen Méndez, as well as London-based Cuban violin virtuoso Ernesto Estruch (Ska Cubano) on "Leave To Remain" and "Pide A Yemayá", and Lokkhi Terra's Justin Thurgur and Graeme Flowers providing some additional brass flair on "Somewhereland", "Run For Cover" and "No Se Vende". Wara have been packing dancefloors and starting parties on the global scene for the last two years. In 2012 they played Glastonbury, the Big Chill Festival, Secret Garden Party, Barbican's Blaze Festival, the Roundhouse, Ronnie Scott’s to name a few. Their 2013 spring tour will bring the Wara live experience to prestigious venues nationwide. With contagious, in-your-face vocals, inspired keyboard playing, a super tight Latin/UK mix on the rhythm section and their MC quick on the rhymes, Wara's musical energy is palpable. If there was ever a collective sound that could embody the global music scene and the world at present in all its multi-faceted beauty and madness, this is it.